Ladies Christelle Liberty Print Tana Lawn Blouse in a floral design. I am so pleased with this blouse, it is a classic, fresh looking design and colour, perfect with a jumper I have already. It looks good with plain trousers or skirt, I’m sure it will become a favourite with me. Lovely blouse - good design, good style and perfect fit. Very pleased with it. 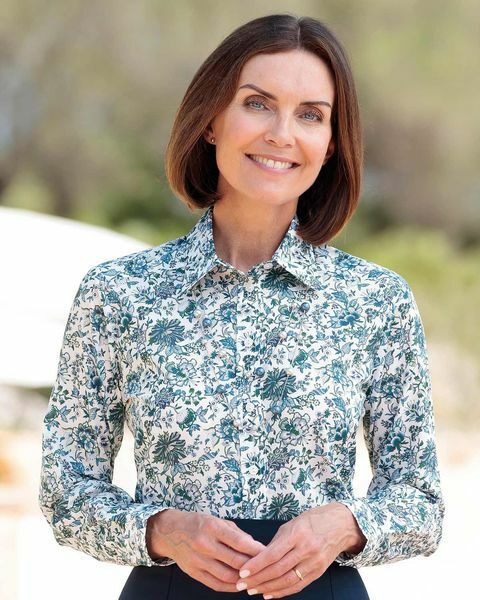 "I am so pleased with this blouse, it is a classic, fresh looking desig ..."
Ladies attractive Liberty Tana lawn floral print blouse in shades airforce blue, sage and navy on a white base. Long sleeved style with a gently rounded hem. This blouse will bring a touch of elegance to your wardrobe.